Lorries ferrying large volumes of swarf are a frequent site at Llantrisant, Mid Glamorgan, South Wales – pecifically around the industrial estates area and even more specifically, arriving and departing at CAV Aerospace’s works there (previously Prematec). The reason is simple: the company specialises in the machining of spars and ribs (below) and detail machined parts – mostly in aluminium – plus sub-assemblies, and as much as over 90 per cent of each billet of raw material is machined away to produce a finished product. CAV Aerospace, Llantrissant, performs this work for prime customers such as Airbus, Boeing, Bombardier- Shorts, and Ronaldsway (see Machinery, 5 November 2004, page 12), Now, with the help of Roemheld’s Stark Zero Point Speedy 2000 Tornado fixturing location system, the company is able to produce even more swarf on its triplet of SNK HPS-120B 5-axis horizontal machining centres – more swarf means more components from the same machine more cutting, less set-up. In the case of ribs, the practice has been that raw material billets are held using vacuum fixtures, the location side having been the subject of a preparation operation. The parts are then machined on the other side. 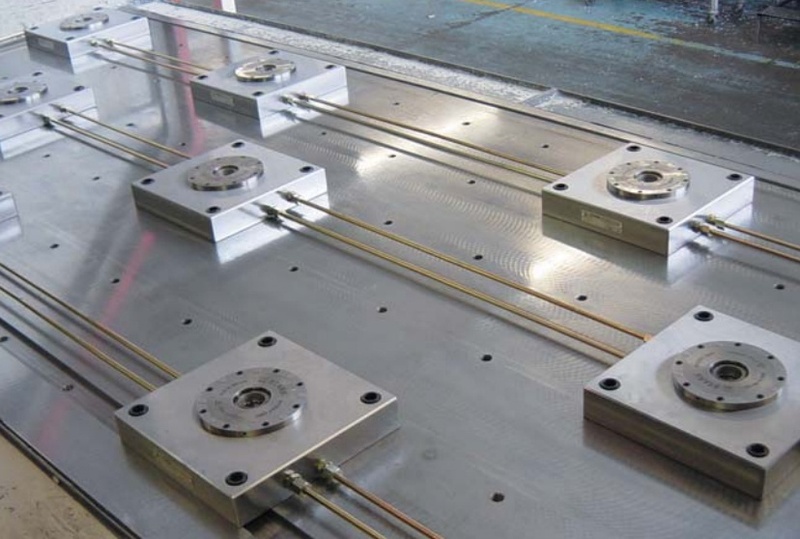 Vacuum fixture plates must be loaded onto a machine table (3,048 by 1,220 mm), manually callibrated and secured, inspected for correct position – with fixture plates skimmed if the vertical position is incorrect. Billets are then loaded, parts machined and when completed removed from fixture plates, the plate manually unscrewed and the process repeated. The fixture plates may be as large as the table itself and this set-up process is both lengthy and prone to error, as senior CNC engineer Andy Green highlights. “The tables have got to be spotlessly clean because of the large contact area between the fixture plate and table.” A single piece of debris can tip a fixture plate and so the plates have to be skimmed to correct the error – taking them off again, cleaning the table and re-loading them is not an option. With this need to sometimes true up a fixture, the fixtures themselves are effectively sacrificed over a period of time as well. In addition to the skimming requirement due to vertical error, any changes in the x-y plane meant that the CNC program origin would have to be changed as well. If a mistake were to be made, the parts could be scrapped – and it did happen, Mr Green admits. The move to adopt improved fixturing came with a project awarded by Australian company Hawker De Haviland for Airbus A320 ribs, numbers 10 to 27. There are 30 ribs in a ship-set for this work package and the size of these parts lent themselves to multiple parts per fixture versus the typical one per vacuum plate for larger items – A320 ribs are some 30 per cent smaller than those for A330/340 and measure from just over 1.5 m long to just under 1 m. “We have to deliver in ship-sets, so we don’t get the opportunity to manufacture 20, 100 or 1,000 off. Instead, we are limited to one or two parts per ship-set. So that means you have to change fixtures much more often than you would do if you were making, say, 100 parts,” explains Mr Green. Benefits would be less setting time to achieve a ship-set since parts could be grouped on a fixture, and for the A320 work only four fixtures would be required to accommodate all 30 parts, one plate taking up to nine different ribs, in fact. The company initially used this fourpallet system in the old manner, without the Stark system and changeover time was around four hours – too long. “We wanted to maximise machine up-time, limit set-up time, and the best way we could do this was by loading and unloading the machine in the fastest possible time using an arrangement that would allow us to get the fixture in the same place every time,” says operations manager Mike Fleetwood. Mr Green, in charge of the set-up reduction project,identified and selected the Stark Zero Point system from a shortlist of two. The Roemheld system has been fitted to all three SNK HPS-120B machines – the first was kitted out in December 2004 and the last in March this year. Each machine has 11 Stark Zero Point base units located on its table, these being arranged so that any plates will locate in a single orientation only. Machine modification time was five to six hours per SNK. The investment made was £12,000/machine and results measured and achieved on the first machine provided a payback of three months and a better than 14 per cent productivity improvement as set-up time had been slashed to 10 minutes. “And the life of a fixture is now almost infinite,” offers Mr Fleetwood. “We have recovered fixture cost and don’t any longer need to plan for fixture replacement every two years,” Mr Green adds. Not just time and fixture cost benefits, though. Quality has also improved with problems associated with achieving flatness and tolerance (typically +0.13 mm to -0.08 mm) now eradicated. Parts are “bang on the money every time,” Mr Green happily reveals. The Stark System obviously has a lower contact surface area, while the location units are self-cleaning too, in contrast to the original system. Although, the Zero Point location/clamping system delivers micron repeatability, the machine setters did initially calibrate fixtures thoroughly, but as confidence grew, a simple zero check now suffices, followed by a quick first-offbefore the machine is set to run. And with everything now more repeatable, hitting delivery schedules has been made easier. CAV Aerospace, Llantrissant’s, other machines are either larger, requiring a big investment for low volume parts and so would have a longer payback, or they are pallet changing, which cancels out the benefit of a system such as Stark. So for the time being these three machines are the only ones that are to be fitted with the Stark Zero Point system. But with the amount of time saved and capacity gained, at least the company won’t need to install machine number four for a while yet, while it is extending the benefits of the Stark system to other parts that can be made on these three machining centres. Apart from product-specific plates, for other components the company uses a grid plate onto which fixtures are then located, the grid plates themselves locating in some of the Stark base units. The company is also currently in the process of making another type of fixture plate that will straddle just two of the base units so that a base plate runs front to back across the table. The use of these straddle plates will support a universal system. The intention is to use these to support A330/340 parts, thus gaining the benefit of the Stark system for these, as well as delivering more production planning flexibility.